I am very thankful that I have been able to keep designing, blogging, and sharing my love of crocheting and knitting with you all throughout the years while being able to earn some income along the way! Even though I provide all my designs for free with ads on my blog, many of you have supported us by purchasing the ad-free PDF versions of the patterns through our Etsy shop, Craftsy or Love Crochet (I will work on trying to get them up on Ravelry in the future). It takes some extra time to convert my patterns into concise PDF’s that contain all the step-by-step pictures, but I think it is well worth it as being able to easily print off a pattern along with all my detailed notes, pictures and tips is very convenient and helpful. 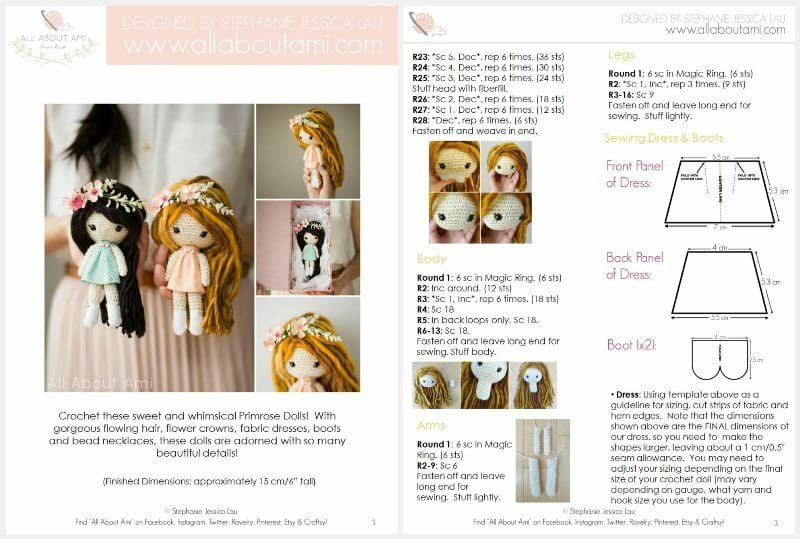 Here is an example of one of my PDF patterns (the Primrose Crochet Dolls) with beautiful formatting! I noticed that people would often purchase multiple patterns at one time, and that got me thinking that putting together some pattern bundles might be a great option. The pattern bundles allow people to purchase multiple patterns at a discounted rate and try out designs that are in the same genre (e.g. amigurumi, knit, granite stitch, etc). For the past couple of weeks I have been slowly working on converting some of my older designs into PDF’s and putting together bundles for my Etsy shop! Keep reading to see the bundles I have put together and enter the giveaway below to win a bundle of your choice (there is also a coupon code)! The Chinese New Year Zodiac Amigurumi Pattern Bundle (8 patterns) contains the zodiac animals we have designed so far: Chinese New Year Doll, Dragon, Snake, Pony, Monkey, Lamb/Sheep, Rooster and Dogs. I love how we have this tradition of designing an animal during their zodiac year, and I know many people who have been following the whole series and have made their own! This series is dear to my heart as Chinese New Year Doll was our very first original design, and I am delighted to have all the designs so far in one convenient bundle. Check out this bundle HERE! 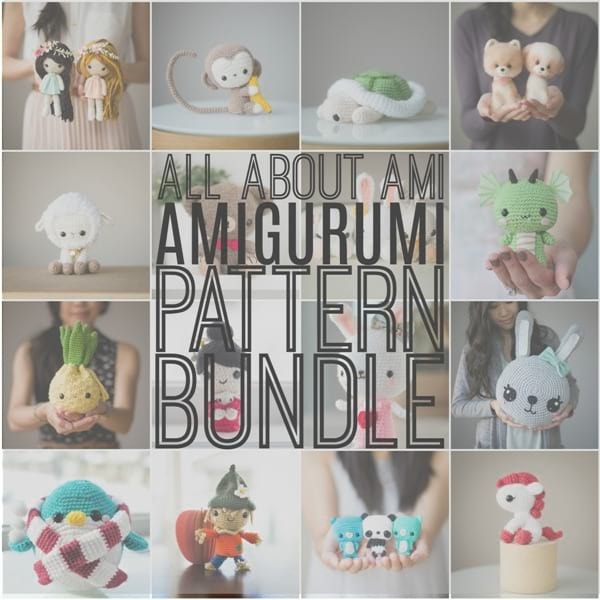 The All About Ami Amigurumi Pattern Bundle (27 patterns) contains all my original designs that have been posted on my blog since 2011. This bundle contains the whole Chinese New Year Series as well as old favourites such as Valentine Teddy and Snuggles the Penguin, and newer designs such as the Primrose Crochet Dolls and Turtle. There are smaller amigurumi (such as the Bonbon Bears and Teddy Ornaments) as well as larger amigurumi that are also home decor (such as the Snuggle Bunny Pillows and Pillowji Pillows). If you love our style of amigurumi, this is a great way to have all of them in one place, ready to be printed and worked through! Check out this bundle HERE! One of my favourite techniques that I discovered along my crochet journey has been learning how to crochet cables! Cables are not only for knitting, and I love how we can create gorgeously textured pieces by utilizing front and back post stitches. I have designed numerous patterns using crochet cables including my Cabled Slouchy Beanie (Adult & Toddler), Chunky Slouchy Beanie, Cabled Beanie version 2, Chunky Braided Cabled Blanket, Cabled Mittens, Cabled Legwarmers/Boot Cuffs, Braided Cabled Slouchy Beanie, and Braided Cabled Cowl. 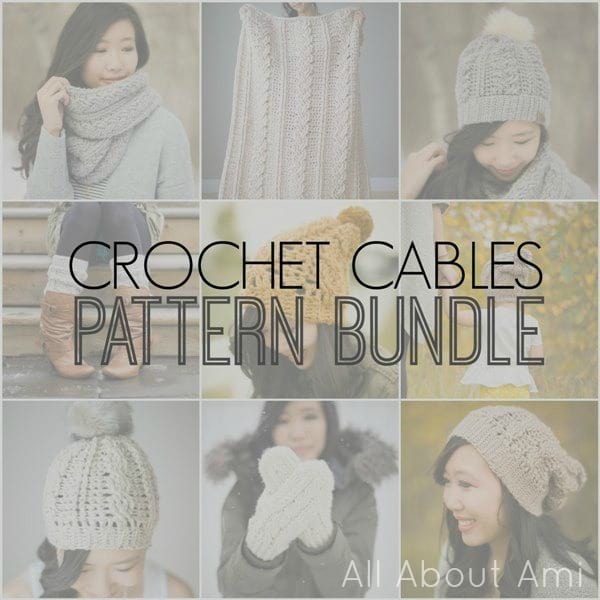 The Crochet Cables Pattern Bundle that I have put together includes ALL nine designs along with the detailed step-by-step cabling tutorials. These elegant designs will help keep you warm and cozy and provide a great challenge and interest with the variety of designs, from beanies and cowls to mittens and blankets! Check out this bundle HERE! 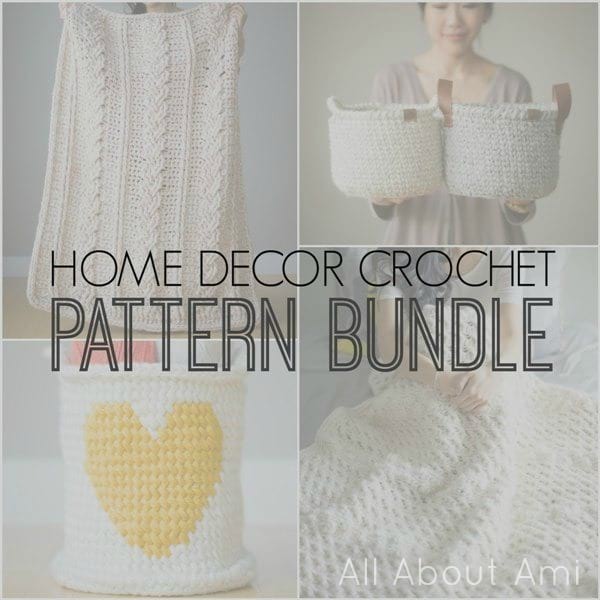 The Home Decor Crochet Pattern Bundle (4 patterns) contains two luxurious blankets and two beautiful baskets. The Chunky Braided Cabled Blanket and Waistcoat Baskets have been very popular designs, and the Heart Basket and Cross Bobble Blanket are great pieces to help you learn some new stitches and techniques. I thought it would be fun to put these designs together into a bundle for those who want to add a touch of crochet to their home! Check out the bundle HERE! One of my favourite crochet stitches that I learned is the stunning star stitch. This stitch is very addictive and particularly fun to work in a round. The Star Stitch Crochet Pattern Bundle contains all three of my star stitch designs, including the Star Stitch Pouches, Star Stitch Purse, and Star Stitch Cup Cozy. All three designs use Lion Brand Yarn’s 24/7 Cotton that really helps to show off the beautiful texture and definition of the star stitch with the mercerized cotton. They make great travel projects, work up quickly, and make wonderful gifts. 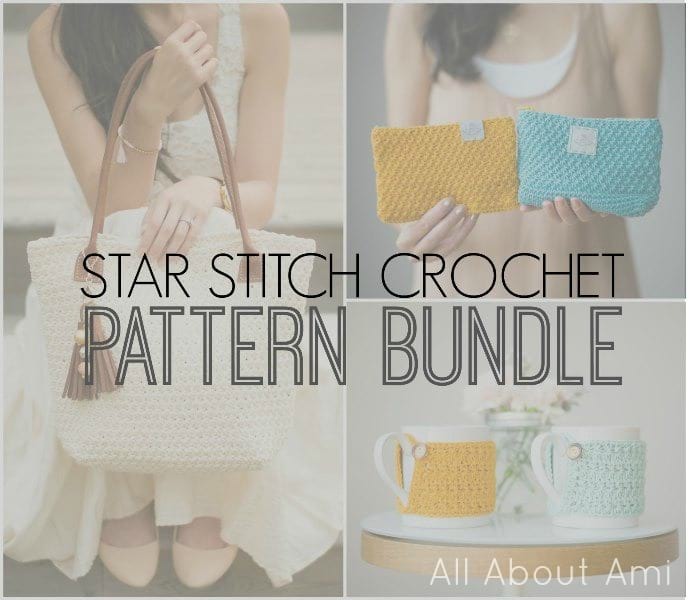 Check out the Star Stitch Crochet Pattern Bundle HERE! Another one of my favourite crochet stitches is the granite stitch! I’ve used this stitch for three garment designs, namely the Granite Cape, Granite Cardigan, and Granite Poncho. All three are stylish garments that are great for layering, and they are fun to work up. The granite stitch is very simple and requires little concentration, so these make great travel or tv-watching projects as well! 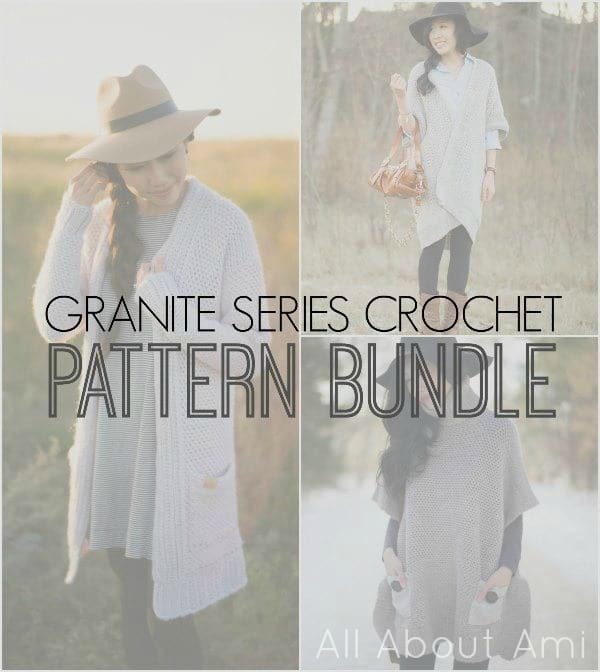 Check out the Granite Series Crochet Pattern Bundle HERE! For those who are interested in learning how to knit, I have put the three designs from my Simple Knit Series together into a bundle! I created the Simple Knit Series for complete beginners, teaching three basic stitches (garter stitch, stockinette stitch, and seed stitch) with step-by-step picture and video tutorials. 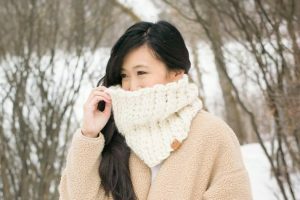 Each stitch is accompanied by an easy and chic pattern that helps you practice that stitch: the Simple Garter Stitch Scarf/Cowl, the Simple Stockinette Hat, and the Simple Seed Stitch Headband (contains Adult, Child, and Toddler sizing). All three designs use Wool-Ease Thick & Quick Yarn by Lion Brand Yarn and larger needles, so they work up quickly and are great for beginners! 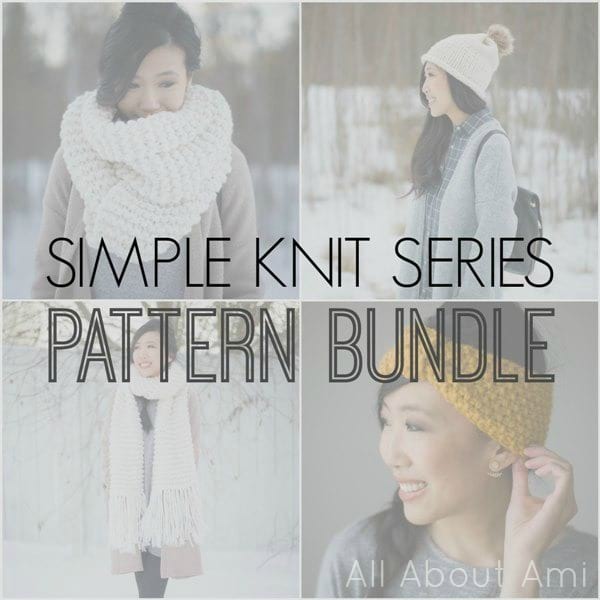 Check out the Simple Knit Series Pattern Bundle HERE! 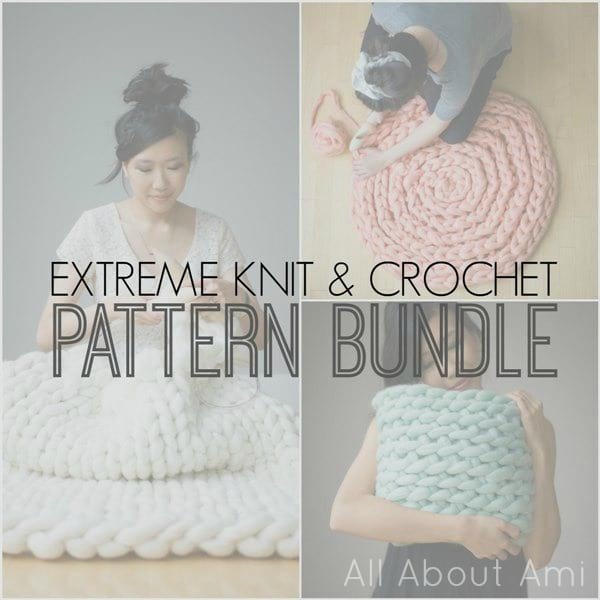 The Extreme Knit & Crochet Pattern Bundle (3 patterns) is for those of you who have always been interested in trying your hand with jumbo yarn and jumbo tools. A couple of years ago I had the pleasure of collaborating with Sarah of Mama Knows Luxury, and I was able to work with her luxurious wool roving and giant knitting needles and crochet hook to design three items. This bundle contains the patterns for the Extreme Knitted Blanket, Extreme Crocheted Rug, and the Extreme Crocheted Cushion. It is so much fun doing extreme knitting and crocheting, and I am so thankful that I had the opportunity to work with this amazing wool and design these luxurious projects that work up very quickly! Check out the bundle HERE! I first learned how to knit when I was a young girl before I actually learned how to crochet. A couple of years ago, I rediscovered my love of knitting, and I have designed some knitting patterns of my own! They are all very simple with minimal shaping as I am still building up my knitting skills. Thus, my knitting patterns are perfect for beginners who want to try making their own easy and stylish projects. The Easy & Modern Knits Pattern Bundle (9 patterns) contains the Midtown Cardigan, Basic Knitted Baby Beanie, Simple Seed Stitch Headband (with Adult, Child and Toddler sizing), Serenity Seed Stitch Cowl, Extreme Knitted Blanket, Simple Garter Stitch Scarf/Cowl, Thick & Thin Cowl, Sea Breeze Sweater, and Simple Stockinette Hat. Check out the bundle HERE! 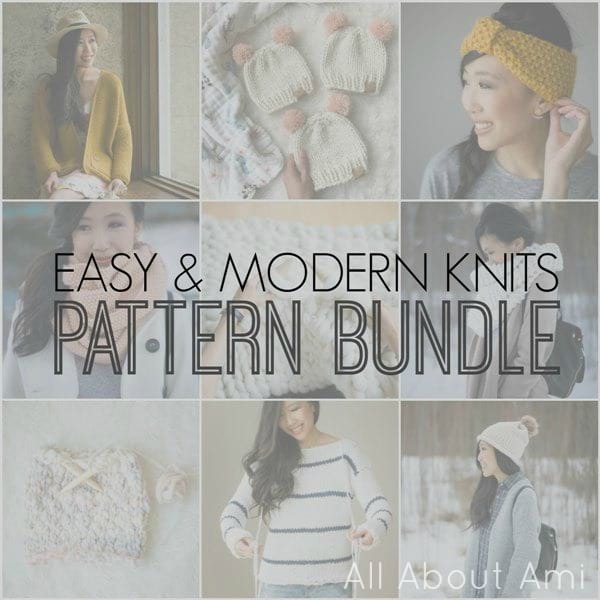 I hope you love browsing these pattern bundles and discovering more of my designs! I am slowly converting my old designs into PDF’s and will try and put together more bundles! For the next 5 days, you can get 25% OFF ANY BUNDLE with the code “BUNDLE25” (you just need to buy at least three patterns in my Etsy shop or any bundle to activate this coupon). Furthermore, if you are not interested in any of the bundles that I have put together, you can BUILD YOUR OWN BUNDLE by purchasing 3 patterns and getting a fourth pattern free (just let me know what pattern you would like for free in the Notes section during check-out). You can combine these promotions together by getting 25% off as well as a free 4th pattern! I’d also love to give away some pattern bundles as a thank you for all your support of our designs throughout the years! Leave a comment below letting us know which pattern bundle you would love to win! This giveaway is open WORLDWIDE and will close on Sunday, July 22nd at 8 PM MST! Thank you, everyone! Don’t forget to subscribe to my newsletter HERE– I’ve got a new crochet garment design coming up soon! I hope you enjoy browsing my pattern bundles and perhaps discover some new designs that pique your interest along the way!